A sweet good-night story by internationally bestselling picture book author Mem Fox! 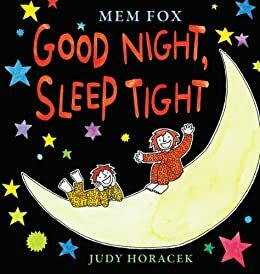 Good Night, Sleep Tight reunites bestselling picture book author Mem Fox with illustrator Judy Horacek, following their collaboration on WHERE IS THE GREEN SHEEP? In this sweet story that's just perfect for bedtime reading, Bonnie and Ben's favorite babysitter tells them nursery rhymes at bedtime--including "It's raining! It's pouring! The old man is snoring"; "This little piggy went to market"; and more. Bonnie and Ben enjoy the stories so much that they don't want to go to sleep; they want to hear each one again! Instead the babysitter tells them new nursery rhymes until, finally, all three of them fall fast sleep. Mem Fox is an author that really makes her stories come alive. My kids have enjoyed her previous stories, and this has only continued with this as well. This story was well written and brought me back to some of the nursery rhymes that I remembered as a child myself. Like in her past books the illustrations add much to the overall story itself, and I have to say that I was very impressed overall with the message being shared in the book as well. This is another great addition to Mem Fox's line of books and I encourage all to read this to your own children...it does work great for a bedtime story!